Bicycling advocacy is kind of like that. Every now and then, bicycling advocacy advances another step. But the victories we win are just the visible tip of the iceberg. Often unseen are the lives forever changed by traffic violence, and the years of battles fought to put a much-needed, common-sense law into place. The three-foot safe passing law is one such example. Safe passing has always been required by law, and yet there are countless examples of drivers passing cyclists within inches—and sometimes, by much less. And yet the burden has always been on the victims of traffic violence to prove that the unsafe pass was in fact unsafe. In response to this topsy-turvy, Alice-In-Wonderland application of the law, a movement sprang up to establish a minimum safe-passing distance in all of the states. If drivers were incapable of determining what makes a safe distance when passing cyclists, the law would spell it out for them. Typically, states have established 3 feet as the minimum safe-passing distance, although that minimum does vary in some states. For example, in Virginia, the minimum was 2 feet (now increased to 3 feet as of last July), while in Pennsylvania, it is 4 feet—and in New Hampshire, the minimum starts at 3 feet for a driver passing at 30 MPH, but increases by 1 foot with every10 MPH increase in the driver’s speed, up to a 5 feet minimum safe passing distance at 50 MPH. Ten months ago, California joined the ranks of states that have established a minimum safe passing distance for cyclists. That was an advocacy victory for cyclists, but lying just below the surface, unseen, was just how hard it was to get the law passed. In fact, the California Legislature had passed a three-foot safe passing law 3 times, butGovernor Brown sided squarely with unsafe drivers when he vetoed the law the first two times it was passed. Still, the law finally instructed California drivers about what constitutes a minimum safe passing distance, and even instructed drivers about how to make a safe pass when it’s not possible to leave three feet of safe passing distance. 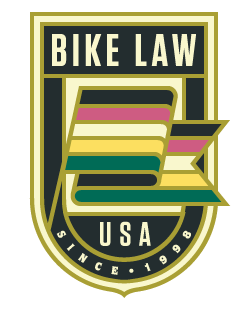 Although the law is not perfect (it was weakened at Governor Brown’s insistence), that’s still a victory for cyclists. But as we might expect, not all drivers got the message. That’s where enforcement comes in. Without enforcement, the message sent to unsafe drivers is that they will not be held accountable. And early warnings about three-foot laws were that they would be unenforceable, because law enforcement wouldn’t be able to prove that a driver passed closer than 3 feet. In fact, however, law enforcement officers in several cities (Austin, Texas,Naples, Florida, and Chattanooga, Tennessee) have demonstrated that where the will to enforce the law exists, it is enforceable. So passing these laws is one hurdle, but it’s not the last hurdle; the laws help educate the public, but enforcement is still the key to making the law work. But what happens when the dangerous driver is a law enforcement officer? This was the question raised in an incident in Los Angeles County this past Saturday, when a California Highway Patrol officer buzzed two cyclists outside of Glendora, CA—and then returned to copsplain why the cyclists were in the wrong (see the video here). Fortunately, one of the cyclists recorded the officer’s discussion of the law, so now we have a permanent record of the officer admitting that he buzzed the cyclists, and explaining why he did it. We also know from the recording that the Highway Patrol officer does not understand California traffic laws. And considering that his main function is to enforce California’s traffic laws, this should be of some concern to his commanding officer. So what was the officer’s point of view? In his own words, “The law requires you to be on the right edge of the roadway.” Let’s address that first. In California, cyclists are NOT required to ride on the right edge of the roadway. In fact, the law permits cyclists to ride in any lane as long as they can keep up with the normal speed of traffic. And if they can’t, they are only required to ride as close as practicable to the right-hand curb or edge of the roadway. But these cyclists were not taking the lane on this otherwise deserted road. As one of the cyclists responded to the officer, “I was riding on the white line [at the edge of the roadway].” In other words, cognizant that they might be passed by drivers while they were climbing up hill, the cyclists positioned themselves exactly where they would be required to ride if a driver came along; the officer’s objection to the cyclists he buzzed was not based in reality. What’s going on here? Only the officer knows for sure, but his behavior was disturbingly similar to the behavior of harassers without law enforcement uniforms. Hold on there, Deputy Dawg. WHAT double yellow line? There’s no double yellow line on that road, nor is there any other sort of line demarcating the center of the roadway. Yes, you have to drive on the right half of the roadway, even if there is no center line, but without a double yellow line on that road, it is perfectly legal for you to pass the cyclists by crossing over the center of the roadway onto the left hand side of the road, as long as you are not passing into oncoming traffic. And since there was no oncoming traffic on that deserted road, guess what? The law REQUIRES you to give three feet by crossing over the center of the roadway. He might as well have asked “What if the moon is made of green cheese?” As the cyclist pointed out, and as anybody can plainly see, NOBODY was coming the other way. But what if somebody HAD been coming the other way? The law would require the officer to slow down and wait until it was safe to pass. In fact, the only way the law would not require him to wait until it was safe to pass would be if oncoming traffic was so heavy that there was no opportunity for him to cross the center line of the roadway. In that case, he would be allowed to pass closer than three feet, but would be required to slow to a safe speed in order to make the pass. Still, the officer stuck to his guns: “I’m not going to drive on the wrong side of the road.” OK, officer, let’s go with that. Pop quiz time. You’re driving on that same road, and there’s a road condition that forces you to make a decision—let’s say a large pothole that will damage your suspension if you drive over it. Do you (A) drive over it anyway and damage your suspension, or (B) do you go around it? Most people, being reasonably sane, would go around the pothole—and they would be perfectly within the law to do so. Are you still going to stick to you guns and worry about whether the moon is made of green cheese? Or would you follow the rational course of action and go around the pothole? I think we all know what the officer would do here if it was about a pothole instead of a cyclist. And that shouldn’t just be a concern for us—it should be cause for concern at CHP headquarters too. Even giving the officer the benefit of the doubt, his ignorance of traffic laws is shocking, and needs to be addressed. After all, one of the important functions of the three-foot law is to educate, and this officer clearly needs to be educated on the law. If he can’t even follow the law because he doesn’t know the law, how can he possibly enforce it? Still, despite the officer’s actions, there’s a silver lining here for cycling advocacy. Last year at this time, another [reserve] officer made headlines when her anti-cyclist video went viral. In that incident, cycling advocates and the Santa Paula Police Chief reached out to each other and met to discuss the problem and seek ways to improve relations between law enforcement and cyclists, and to work to improve officer education. The former reserve officer (she was immediately asked to resign) who had made the offending video even reached out to cyclists; after going on a ride with cyclists, she had a change of heart and made another video in which she urged drivers to develop a greater awareness of safety for cyclists (see the video here). I believe the same opportunity presents itself here. What results will be achieved can only be guessed at right now, but as Bob Mionske said said back then, “when life hands you lemons, make lemonade.” This is the time to make lemonade, so let’s get on it.